4 Final Games in 2018! SALISBURY, Md. -- The Delmarva Shorebirds return to Arthur W. Perdue Stadium to close out the 2018 home schedule with a four game series against the Hickory Crawdads (affiliate of the Texas Rangers) from Monday, August 27th through Thursday, August 30th. 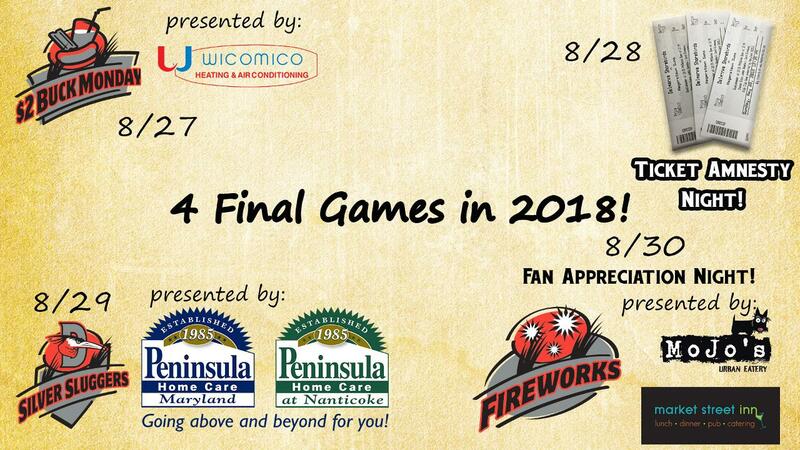 Monday, August 27th is the last 47 ABC 2 Buck Monday, presented by Wicomico Heating & Air Conditioning. Fans can enjoy upper reserved tickets, hotdogs, and fountain Pepsi products for $2 each. Gates open at 6:00 PM with first pitch scheduled against the Hickory Crawdads scheduled for 7:05 PM. Ticket Amnesty Night is on Tuesday, August 28th. Fans can redeem any unused ticket from previous 2018 games for an upper reserved ticket on this night for free. Gates open at 6:00 PM with first pitch against the Hickory Crawdads scheduled for 7:05 PM. The last Silver Slugger game is on Wednesday, August 29th, presented by Peninsula Home Care. The first 1,000 fans can play Baseball Bingo. First pitch against the Hickory Crawdads is scheduled for 7:05 PM with gates opening at 6:00 PM. The 2018 season ends with a packed full Fan Appreciation Night on Thursday, August 30th! There will be lots of prizes given away throughout the game! Fans can enjoy $2 upper reserved tickets and hotdogs along with KISS 95.9 Thirsty Thursday specials that include $2 16 oz. cans of Miller Lite and Coors Light, and $2 Pepsi fountain drinks, presented by University Village at Salisbury. Stick around after the game for one last Q105 fireworks show, presented by Market Street Inn & MoJo's! Gates open at 6:00 PM with first pitch against the Hickory Crawdads scheduled for 7:05 PM. Save time. Skip the line. Pick your seats. Print at home. Buy your tickets online at www.theshorebirds.com/tickets.